Location: Along the east side of Hooper Street North of Cavanagh Road (See attached sketch). Maximum Use: Industrial and/or Commercial Uses. Development Permit Application would be required. Notes: Purchaser must install services and entrance from street. Town will construct new street and service. Location: Corner of Industrial Avenue and Bates Drive. Notes: Purchaser must install services and entrance from street. Click here for .PDF drawing of the site. ❖ The Town will install one residential service connection (water, sanitary and storm) to the property line. 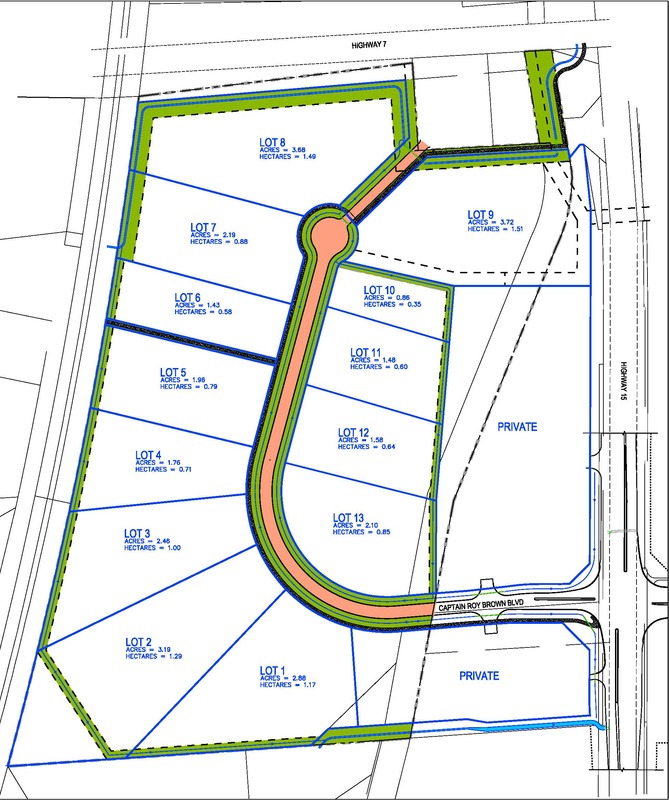 ❖ The Town will install two residential service connections (water, sanitary and storm) in the middle of the property to the property line. Size: Frontage 189.66 Area 19,797 sq. ft.
❖ The Town will install up to 9 residential service connections (water, sanitary and storm) to the property line. ❖ Part 4 can be divided and conveyed as separate parcels. Size: Frontage 53.54 Area 43,037 sq. ft.
❖ Ownership of Part 5 will be included with the purchase. However, Part 5 will be subject to an easement allowing others to travel over this part..